For Maggie's birthday, we took the girls to Build-a-Bear. In hindsight, it was a stupid idea. Maggie had no idea what was going on. She just pulled stuff off the shelves that was toddler level and then put it in her mouth or threw it over her shoulder. 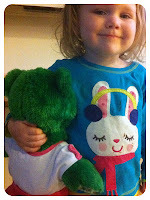 Hannah was old enough to "get" it, and surprisingly had some strong feelings about her bear. 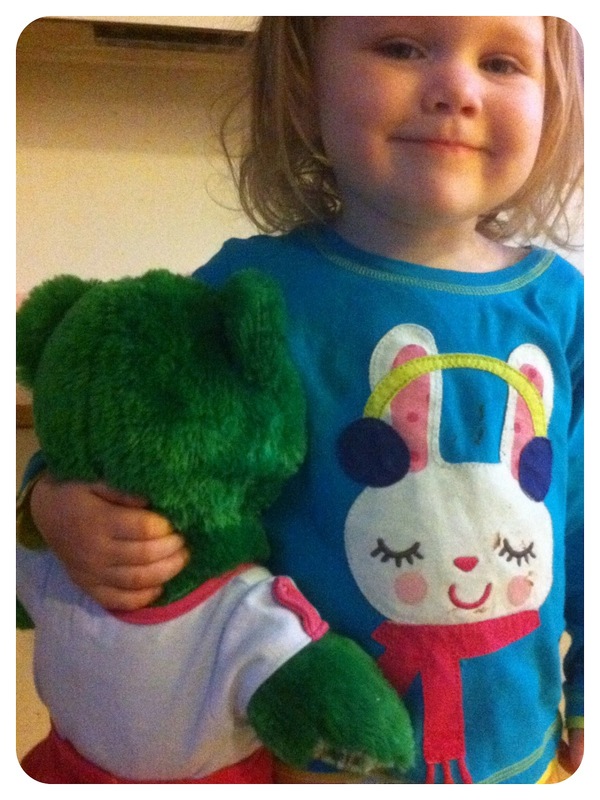 She knew exactly which one she wanted (the bright green one) and how she wanted to dress him. She found a blue, pink, and purple t-shirt and pink skirt. When it was time to give the bear a name (for the birth certificate they come with), Hannah looked at us like we were idiots. He's Builda Bear. Obviously. Hannah, in her "Hello Bunny" shirt (she came up with that all on her own) and Builda, in his pink skirt. 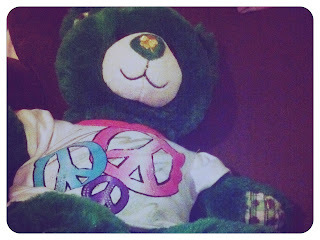 Hannah excitedly introduced the bear to her aunt, telling her "This is my new bear. His name is Builda"
"Very Nice. Builda? I like it. And he is a boy?" "But doesn't he wear a skirt" Sarah asked, insightfully. "Yeah. Sometimes he does." Hannah replied, matter-of-factly. Turns out, Builda is a boy bear who sometimes wears a pink skirts. And for what it is worth, we totally support his right to wear a pink skirt sometimes. We love him exactly how Hannah/Build-a-Bear/God made him. Kiddos are so funny! Everytime I think of "Builda" I crack up! What a sweet little girl Hannah is!